It is said that there is an ancient tree in the world. People who bless it will get good luck. For hundreds of years people call it Lucky Tree. Many years ago, when the dark forces attacked this land, it disappeared from people’s view. No one knows its location. Now Lucky Tree is discovered by angels. They bring it here, and hope to help you get luck and power! Lucky coins, diamonds and possibly many other items are hanging in tree. You can get these items and corresponding points by blessing Lucky Tree. 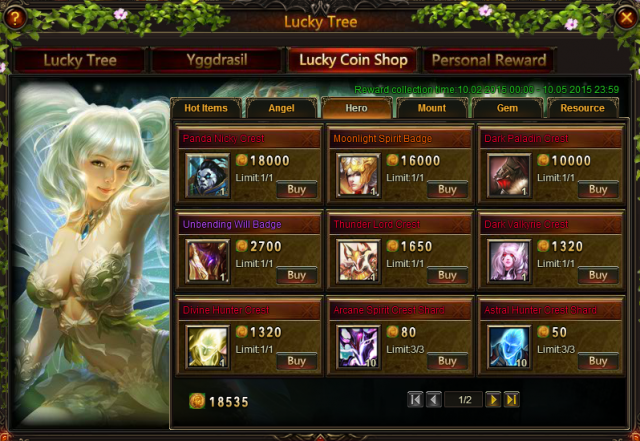 Lucky coins can be used in lucky coin shop to buy more items. The points you accumulated can add to the points of Yggdrasil, namely the World Tree, which shows total points of the server. 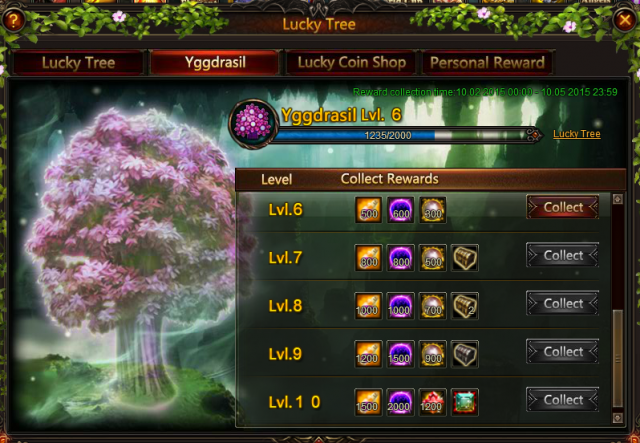 Each time Yggdrasil upgrades, all players in the server can collect rewards for once, and the items hanging in Lucky Tree will be upgraded too. - Players get 1 free attempts daily, VIP4 and above players get 1 more free attempt daily. 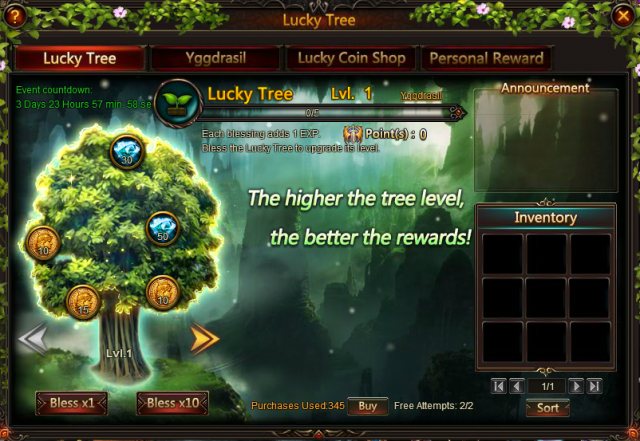 - Blessing the Lucky Tree will earn players personal points, Lucky Tree EXP and World Tree EXP. 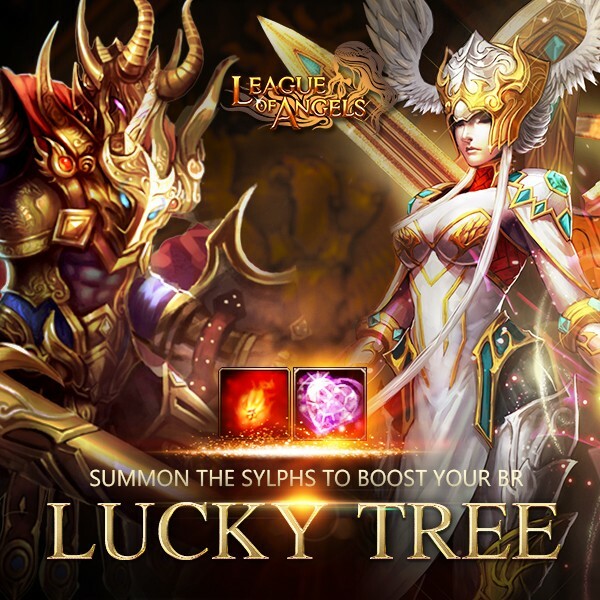 - Players can only bless the Lucky Tree according to their levels. However, they may view the Lucky Tree loot for other level. - The higher the Lucky Tree level is, the better the rewards are. - Lucky coins gained from blessing can be used to exchange for rewards in the Lucky Coin Shop. 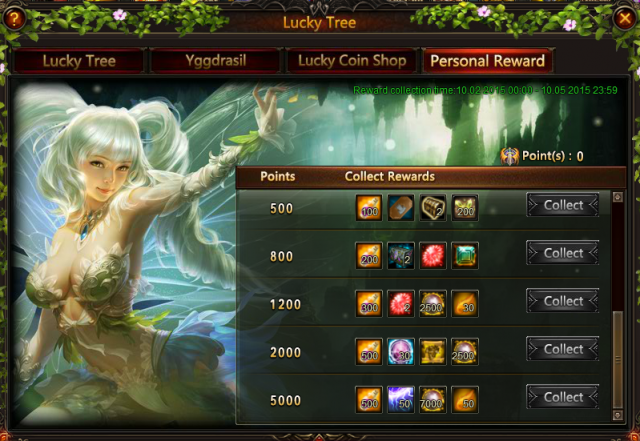 There are four tabs above the interface, namely Lucky Tree, Yggdrasil, Lucky Coin Shop and Personal Reward. In the tab of Lucky Tree, you can bless the tree and get the items dropped from the tree. Bless attempt can be bought by diamonds. 1 Bless = 1 Lucky Tree EXP = 1 World Tree EXP. Please note that Lucky Tree level is based on your own Lucky Tree EXP, while World Tree Level is based on the total points gained by all players in this server. You can gain more Nectar in hot events or purchase by diamonds to gain extra Bless attempt. In the tab of Yggdrasil, you will see the status of World Tree EXP. When World Tree upgrades you can collect the rewards accordingly. Here is World Tree reward list. Here comes the Lucky Coin Shop. As you can see, in this shop there are many attractive items and all the items have been classified, which makes a better shopping experience. Use your Lucky Coins to buy stunning Artifacts, Angels, Mounts, Gems, Sylphs, Skill Books, and many other resources. This time, The Conqueror, Moonlight Spirit, Purgatory Soul, Azure Dragon, Ice Totem (Topaz), Divine Emblem, Purifying Soul, Aphrodite's Awakening Stone , Shield of Discord, Heaven's Melody( new angel artifact), Varda's Awakening Stone, Celestial King, and Polar Bear, are now available in Lucky Coin Shop. Please note that The Conqueror Badge is wrongly described as Unbending Will Badge, which will be corrected in the next version update soon. This is Personal Reward tab. Your personal rewards are based on the points you have got. Rewards are better when you get more points. Here is Personal Reward list. Description: Send roses to your friends to get great rewards for both of you! Get Fortuna's Awakening Stone here!! 1. Go to the character menu and click on the Rose icon in the upper right corner to bring up the Rose sending menu. 2. Roses can be obtained from Garden, Facebook Like & Share Rewards, and the Shop. 3. Send Roses to your friends to get great rewards for both of you! 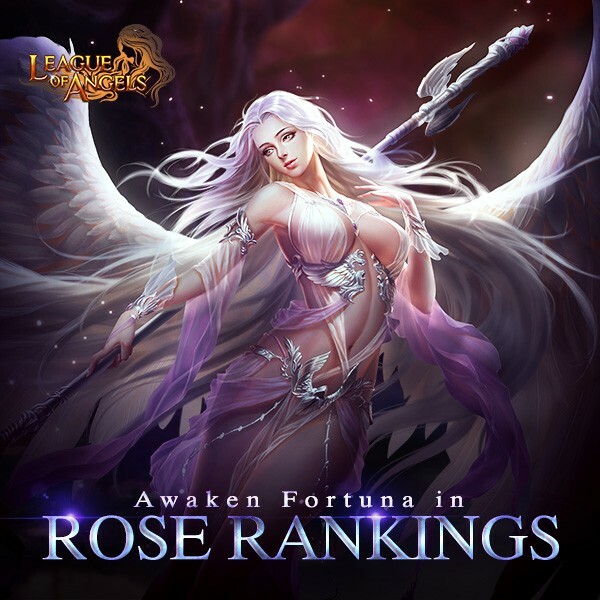 - For each sent Rose bunch, you will receive a Rose Chest in return. - At the end of the event, the Top 10 players who have received the most Roses and have at least 2499 will have a chance get Halloween Spooks and many other rewards. Description: Get roses by reaching certain devotion, and you can also buy more discounted roses here. For hot events please check in game or see in Beach Treasure news. More exciting events are coming up through Oct 2 to Oct 5 (Server time), check them out in the in-game Hot Events menu now!